Start by going online searching keywords related to transgender health care and your surrounding area. For example, in British Columbia, Transgender Health Information Program (THiP) comes up in a search (Note: All of the information on THiP will soon be amalgamated into the Trans Care BC website). From learning about surgeries and hormones, to finding a primary care provider and/or counsellor, THiP is a hub of information for people living in BC. You can also contact THiP to ask questions related to trans health care and for guidance on navigating care, finding a doctor and much more. For information on Canada-wide resources, UBC’s Stigma and Resilience Among Vulnerable Youth Centre website has a non-age specific list of transgender information and resource centres. You can also search for the LGBTQ2SIA+ community centre of the major city closest to where you live. While they may not have all the answers you’re searching for, they may be able to connect you with someone who does. If you need a family physician, consider visiting the website of the College of Physicians and Surgeons in your province (if you are in Canada). In BC, for example, the website details which doctors are accepting new patients. Family doctors have varying levels of competency when it comes to providing trans-specific healthcare. If you have a family doctor and feel comfortable enough, talk to them about your situation and ask them if they have any experience working with trans people. Consider bringing an ally with you for support to your appointment. If your doctor has experience working with trans patients, excellent! If their reaction is negative, contact your provincial or state trans care organization (providing one exists) and ask them for suggestions on how you can access a trans-competent care provider. If your doctor has limited to no familiarity providing trans care but is supportive, recommend they talk to the people at your provincial or state trans health organization for guidance. In BC, for example, your doctor can visit the Trans Care BC website’s page for Health Professionals for information. 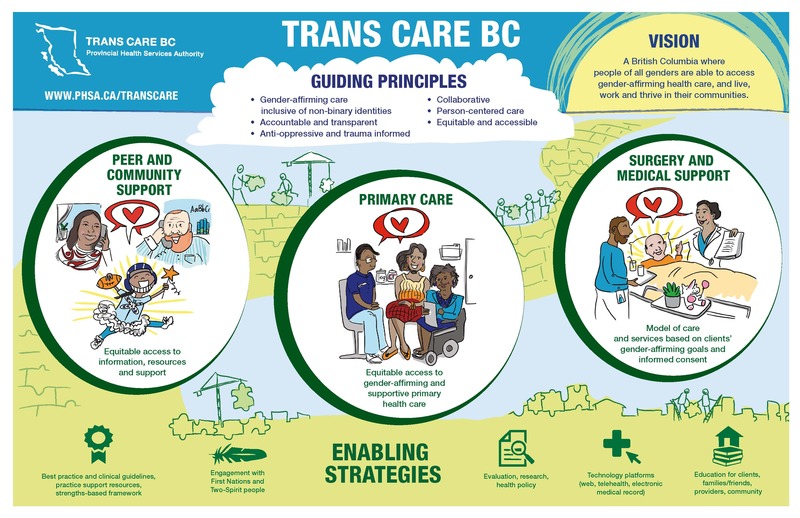 In coming months, Trans Care BC will also be hosting e-learning modules so that healthcare practitioners can educate themselves in offering trans dignified care. They can also call the RACE (Rapid Access to Consultative Expertise) line at 1-877-696-2131 and request the transgender option. By doing this, practitioners can learn how to support trans patients with gender-affirming care. If you need access to gender affirming surgery and/or hormones, navigating the medical system while living rurally, remotely or in a small community can seem daunting. Fear not, as it can be done! If you have a family doctor, they should be able to guide you through the process or find out how to do so. If not, then websites such as Trans Care BC’s have a wealth of information about accessing hormones and surgery. In BC, people seeking hormones and gender-affirming surgeries are assessed. For hormones, the assessment can be done by qualified clinicians, which can include family doctors, nurse practitioners, counsellors, psychiatrists, or psychologists with training in transgender health issues. Also, if a care provider is comfortable, they may assess and prescribe based on informed consent. For surgery, your Primary Care Physician needs to send a referral for a surgical readiness assessment to PHSA Trans Care BC or to a provider (i.e. a psychologist or psychiatrist) they know who already provides surgical readiness assessments. Travel may be required for for assessments, routine checkups, and surgeries. This can be expensive and time-consuming though some things may be done to help. In BC, the provincial medical services plan will cover certain travel expenses for services that are billable through the public health plan (MSP) and are not offered in your surrounding area. This requires paperwork, so make sure to ask your doctor (or the specialist) for a travel form when going to an appointment with a surgeon, endocrinologist, or for surgery. Also, the charity Hope Air connects Canadians in financial need with free travel to medical care far from home. Finally, if you need to stay in a hotel, many hotels offer discounts to people who are in town for medical procedures, so be sure to ask about this. For out of town medical appointments, there may also be the option to meet the specialist via a special computer software (think Skype for doctors), so be sure to ask about this too when booking appointments. For example, if your family doctor prefers you see an endocrinologist rather than monitor and prescribe your hormones, you still may not have to travel if the endocrinologist you are referred to uses this software. The endocrinologist will simply email you your lab requisition and hormone prescription(s) after you meet online. Inquire about what may be possible as you may be able to gain access this way to services in urban centres without having to travel there. You may want or need a therapist to help support through the transition process. Some therapists work on Skype or by phone and the provincial/state run trans health programs or even LGBTQ2SIA+ community centres will likely be able to give you some names of counsellors. If you prefer an in-person therapist and live away from a major city centre, you may need to educate the counsellor on trans issues, which is not ideal. Weigh how much you need therapy (and what kind) and how much you need your counsellor to be trans-competent. If you find yourself in this situation, recommend the counsellor connect with an organization such as Trans Care BC, which counsellors can contact directly to help them begin to gain some trans-competency. Finding the support you need as a trans person living rurally, remotely, or in a small town, can sometimes feel like navigating a maze. Though accessing the services and providers needed often takes far more time than is ideal, remember there are people working to provide trans-competent care. We hope this article helps connect you to them.